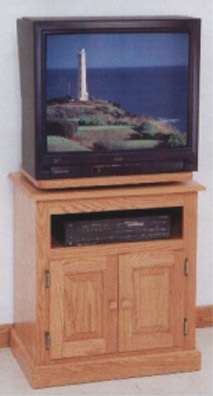 Model #618 - Amish made solid oak TV stand with swivel top is the smallest in our line of Amish oak TV stands. Solidly built, like all the Amish furniture you will find at Clayborne’s, it features a separate space for the VCR, DVD player or Satellite receiver to give it room to breathe, and a nice, enclosed cabinet on the bottom that features a pair of attractive raised panel doors. There is no shelf in the bottom cabinet.